Happy Halloween! BLOODSTOCK is excited to announce four more bands for 2019, guaranteed to make next year’s best metal weekender howlingly spooktacular. At Halloween, the appropriately named SKELETONWITCH join the Saturday bill on the main stage. Having released their sixth studio album, ‘Devouring Radiant Light’ back in July, the Ohio-based band have just been on the road opening for System of A Down in the US. Check out ‘Fen of Shadows’ and if that piques your interest, stream the whole album over at http://smarturl.it/SkeletonwitchDRL. 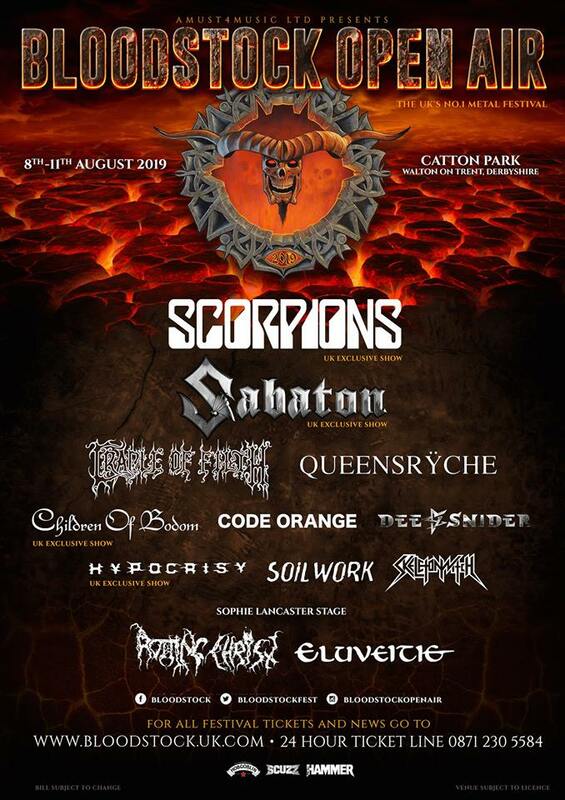 These four bands join the previously announced Friday night headliner, SABATON, Sunday’s bill toppers SCORPIONS, together with CHILDREN OF BODOM, SOILWORK, CRADLE OF FILTH, DEE SNIDER, QUEENSRYCHE, and HYPOCRISY on the Catton Park stages next August. Stay tuned for more bands to be announced soon! BLOODSTOCK’s Rock Society memberships also go on sale at 9am tomorrow, Wednesday 31st October. The Rock Society is effectively the festival’s ‘Members Club’, offering not only a 10% discount on your weekend ticket (on top of the early bird discount when you purchase the ‘Rock Society membership + ticket bundle’ option), but all sorts of other cool benefits like priority signing tent access, access to the VIP Serpents Lair bar, special tours of the backstage & production areas seeing ‘behind the scenes’, a Rock Society laminate, a dedicated hangout area in the Rock Society tent on site and plenty more besides. Full details can be found at http://www.bloodstock.uk.com/pages/rock-society. Memberships are limited to just 300 and sell out almost immediately. Priced at £75, these memberships are available on a ‘first come, first served’ basis so be ready in the ticket store at 9am on Halloween if you want to join the club! For a bit of skele-fun on Halloween, head over to BLOODSTOCK’s Facebook at https://www.facebook.com/bloodstock/ for a fangtastic one day only competition to win a Hell-ishly good prize. Standard weekend tickets are also currently available at ‘early bird’ prices (just £132 for four days of metal fun), so pick up yours at the ticket store – http://bloodstock.seetickets.com – if you want to save a few quid. Camper van passes are also available in limited quantities, but be quick, as limited spaces remain.